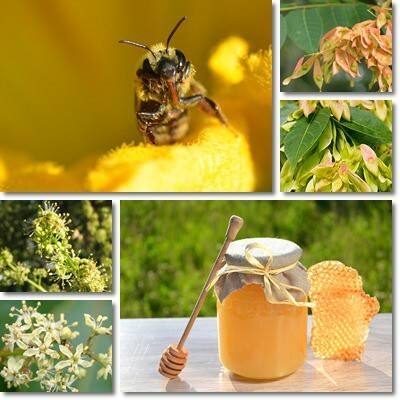 Tree of heaven honey is a monofloral honey variety made from the flower nectar and pollen of a species of tree called ailanthus or tree of heaven (Ailanthus altissima). The honey is a delicious variety with a sweet taste, but an initially bad odour which might discourage consumption at first. It stands out as a good tonic and sweetener, with antiseptic and antibacterial effects as well as antioxidant properties. The raw honey is said to help calm cough, soothe a sore throat and stomach upset, combat fatigue and low blood sugar levels. Despite the incredibly widespread distribution of the tree species, tree of heaven honey is rare and produced in very small amounts because the tree species is regarded primarily as an invasive weed and, as a consequence, its economic and ecological potential are disregarded. The species originates in northern China, but has been introduced in Europe, Canada, Northern America, South America, Australia and New Zealand where it is currently naturalized (established as a native species). It flowers from April to June, depending on the region, and honey bees are one of the many insect species that feed on its flower nectar. What makes the tree of heaven unappealing and draws attention away from its qualities is its invasive nature. The tree hinders the growth and discourages the development of other plants around it by secreting allelochemicals, compounds that disrupt the growth of competing plants. This allows the tree of heaven to overpower an area and hinder the growth of surrounding plants. The tree is also fairly difficult to take out and, if cut, it grows more vigorously than before. As it is, the tree of heaven is a vigorous species with a fast growth, reaching 25 meters in height. Imagine cutting it and more branches stemming from a single one at a faster rate than they would normally grow. Moreover, the bark is potentially toxic to both animals and humans which is why preparations from it should be avoided, despite claims of therapeutic effects. The bark can cause contact dermatitis, while the flowers have allergenic potential and can cause allergic rhinitis and even more serious allergic reactions. Ironically, although it is called the ‘tree of heaven’, the species has a rather foul scent that discourages proximity. However, the flower nectar is an appealing source of food for honey bees and contributes to honey production. What does tree of heaven (ailanthus) honey look like? Ailanthus altissima honey is amber-colored (meaning a translucent brownish yellow) and liquid, but crystallizes soon after harvest, in a matter of months, forming fine crystals that give it a pleasant texture. The crystallized honey takes on a lighter pigment with slight beige undertones and becomes opaque. It is not uncommon for ailanthus nectar to contaminate other honeys such as acacia, the two tree species flowering at the same time and inhabitting roughly the same regions. It can also be found in chestnut and linden honey. What does tree of heaven (ailanthus) honey smell and taste like? The honey initially has an unpleasant scent, a characteristic passed on from the tree. Its smell is somewhat reminiscent of mushrooms, but with fruity notes. Fortunately, the bad smell and overall unpleasantness goes away with time and the honey becomes quite savory, fine-tasting and simply improves its taste a lot. Tree of heaven honey has a medium-sweet taste and is slightly acidic. It bears unique flavor notes, the most prominent being that of muscat. Overall, it is a flavorful, savory honey. 1) Natural antiseptic and antibacterial. The content of hydrogen peroxide, the low moisture and acidic pH of Ailanthus altissima honey are what make it a great natural antiseptic and antibacterial. The raw honey is eaten for upper respiratory tract infections, especially those located in the throat, helping both reduce bacteria numbers and preventing the spread of the infection. Honey wound dressings can encourage faster wound healing by preventing bacterial growth. However, it has to be raw. Any form of processing or heating destroys its beneficial effects. 2) Helps calm cough and soothe sore throat. Eating a tablespoon of raw honey several times a day can help calm cough and soothe a sore throat. The honey forms a sort of protective layer over the irritated throat lining, preventing further inflammation and allowing it to heal. Moreover, it actively contributes to reducing bacteria numbers due to its antimicrobial properties. 3) Source of vitamins, minerals and other nutrients. Like all honey varieties, tree of heaven too is a source of vitamins and dietary minerals such as vitamin C, B vitamins, potassium, phosphorus, magnesium, calcium etc. It also contains small amounts of other nutrients (amino acids) as well as other elements of nutritional value (various antioxidants or pollen particles). The overall nutritional value of the honey is low, but remains nonetheless a nourishing food. 4) Energizing properties. 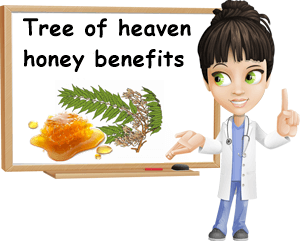 Tree of heaven honey helps combat fatigue and hypoglycemia (low blood sugar levels). It’s honey so it’s a source of natural sugars that raise our blood sugar and energy levels quickly, giving us a temporary energy boost and preventing hypoglycemia symptoms and fatigue. However, it is important to consume it with moderation (diabetics should consult a doctor first). 5) Good for stomach health. The natural sugars in tree of heaven honey boast mild prebiotic effects, contributing to digestive health by feeding the good bacteria in our intestines. Moreover, the honey has a soothing effect on the stomach, helping calm discomfort and indigestion and possibly contributing to gastritis management and treatment. Conclusion. Honey from the tree of heaven, also known as ailanthus honey is a monofloral variety of particular savor which harmonizes with different flavors, from fruits to aged cheeses. The honey holds several great health benefits, a direct result of its antibacterial, antioxidant, soothing and tonic properties. However, if you are allergic to Ailanthus altissima flower pollen or to enzymes secreted by honey bees for the production of honey, then you should avoid eating tree of heaven honey, or any honey or bee byproduct if the allergy is to bee products. Given its rarity, it can be found mostly with local producers from Italy and Hungary in particular.